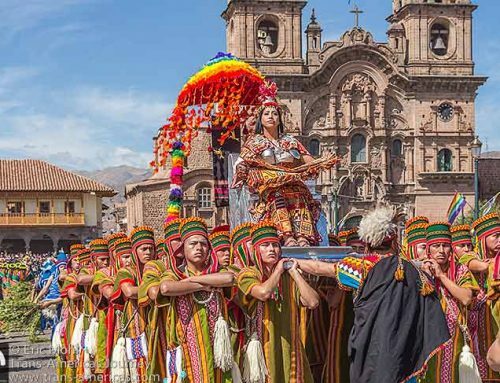 Some consider the annual Mistura event in Lima, Peru to be the most important food festival in South America. We finally attended for the chance to check out foods from across the country. 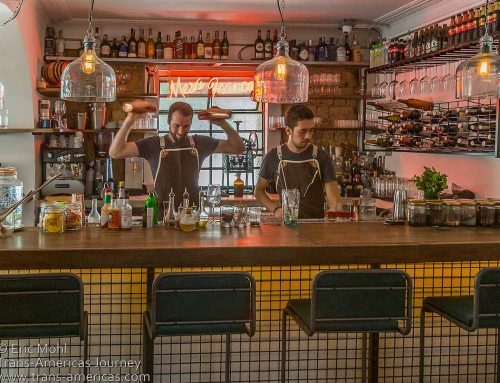 Here’s our guide to foods of Peru and what to eat at Mistura. There’s plenty of pork at the MIstura mega food festival in Lima, Peru. Mistura organizers told us that mistura is a word that dates back to the Viceroyalty of Peru in the 1500s when it was used to refer to a mixed bouquet of flowers distributed during special occasions. Today the word basically means mixed. 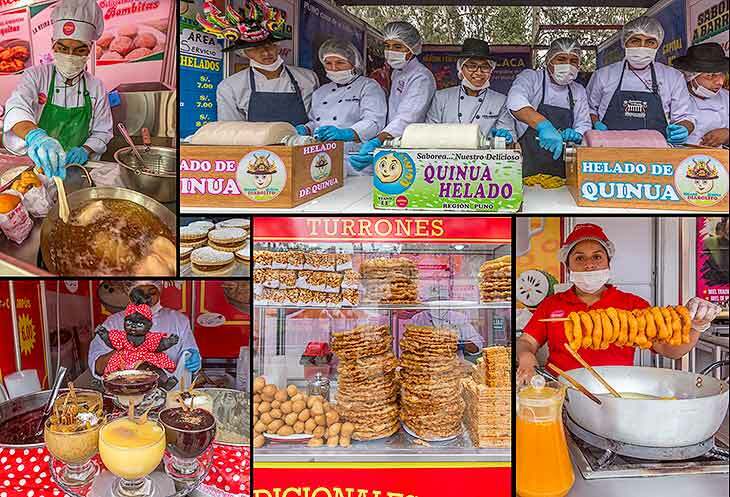 To picture what the 10 day Mistura event is all about imagine a national fair with all the non-food elements stripped away — no rides, no carney games, no livestock exhibits. This leaves just the most beloved traditional foods, ingredients, and techniques from every corner of the country – everything mixed together. Food is a powerful thing. Many Lima natives have family roots that go back to some other place in Peru and most of the people we saw at Mistura seemed to be there to get their annual fix of foods they miss from “home.” Though the numbers of vendors and attendees have been declining in recent years, there were still 302,139 attendees and 180 food vendors at this year’s 10th anniversary Mistura event which was themed Neighborhood Flavor. 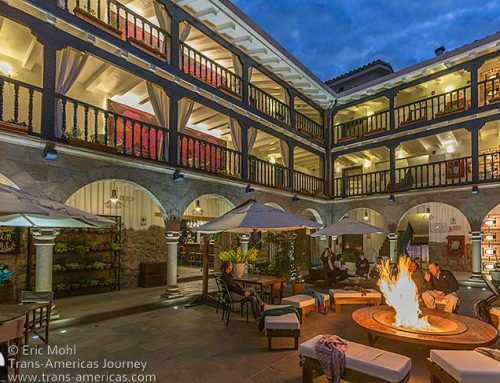 That makes Mistura the perfect opportunity to get to know the most iconic foods from around Peru all in one place. 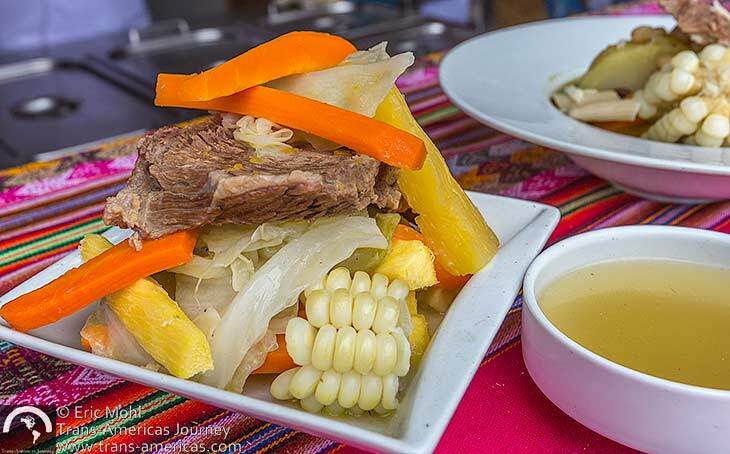 Anticucho is a Quechua (a pre-Colombian Andean language that’s still spoken in Peru) word for stewed meat. However, the word now refers to a beloved street snack of sliced marinated beef heart grilled on a skewer. We love them and our one big regret from Mistura 2017 is that we were too full to try the anticuchos made from alpaca heart. Just two examples of ceviche at Mistura. Ceviche (spelled cebiche in Spanish) is arguably the most famous dish in Peru and is essentially made by marinating fish or seafood in citrus. 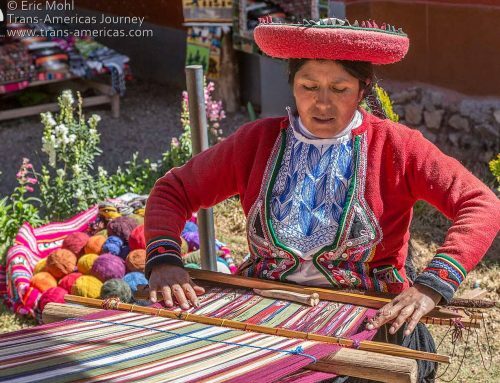 Peru has many, many variations on this theme including a version in the Andes that’s made from bean-like seeds. Below is a traditional fish ceviche with chicharron de pescado (fried fish pieces) in a marinade made with citrus and gooseberry-like uchuvas (left) and a trout ceviche (right). Peruvian ceviche is nearly always served with creamy camote (sweet potato) and crunchy cancha salada (corn nuts). Two gourmet versions of causa at Mistura. Causa, which dates back to pre-Columbian times, is a uniquely Peruvian dish which we have not seen in any other Latin country (so far). The potato comes from Peru where more than 3,000 varieties are grown and this dish, made with mashed potato and aji amarillo (yellow chile) layered with almost anything filling you like, makes the most of Peruvian potatoes. 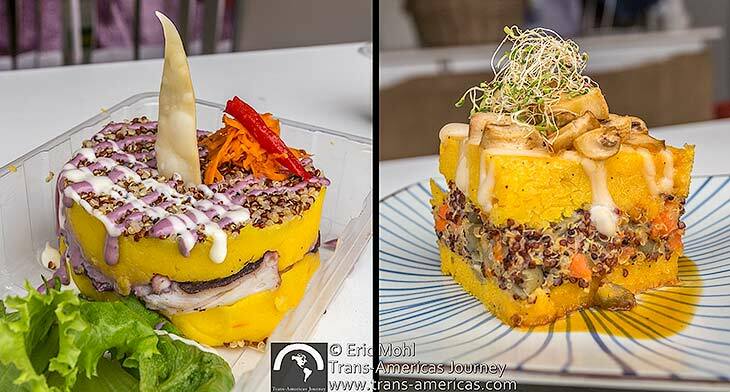 Below is are two fancy causas, one (left) made with pulpo (octopus), and a vegetarian causa (right) made with quinoa, mushrooms, and a passion fruit sauce. 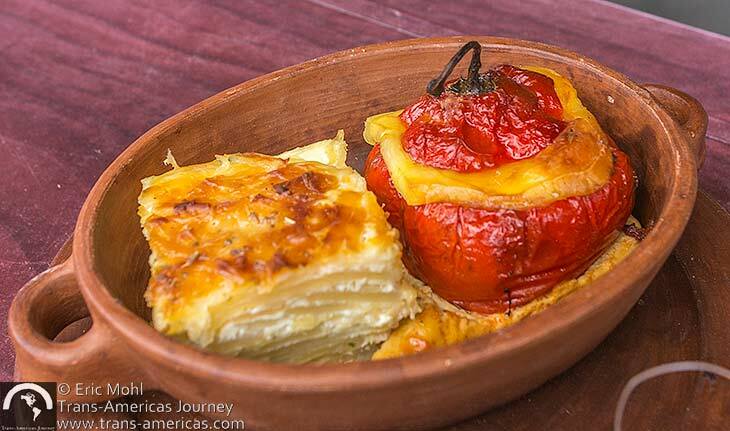 Rocoto relleno is a popular dish that originated in the city of Arequipa where Karen recently learned to make the dish at Zingaro Restaurant in Arequipa. It’s a Peruvian variation on a stuffed pepper made with the beloved rocoto pepper which is usually filled with seasoned ground beef before cheese and a bechamel-like sauce is added. Tamales (left) ad juanes (right) at Mistura. 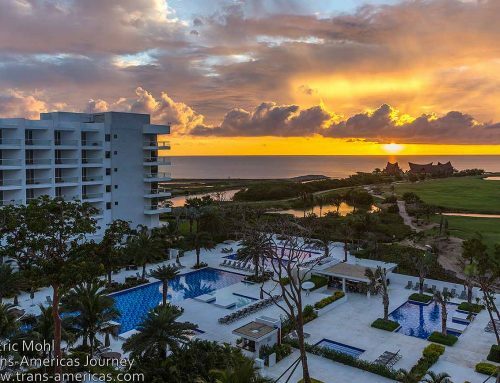 Tamales are enjoyed throughout Latin America and are made from a corn flour steamed in a corn husk, often containing a piece of meat and spices. Juanes come from the Peruvian jungle. 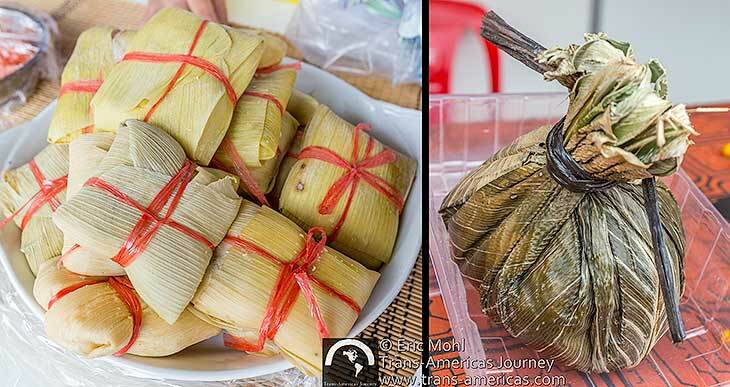 Instead of corn, they’re made with rice which contains meat and a piece of hard-boiled egg all wrapped in a bijao (heliconia) leaf then steamed. Two types of soup at Mistura: chupe de camarones (left) and parihuela. Soups are important throughout Latin America. 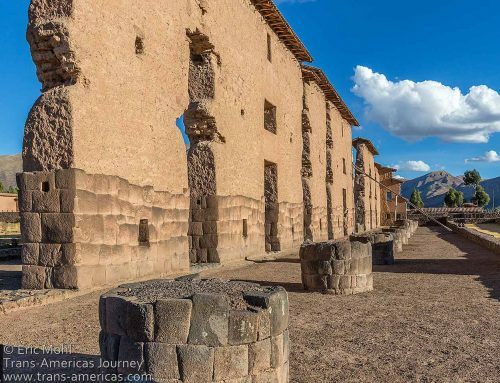 In Peru, favorites include chupe de camarones which is a shrimp soup, parihuela, another style of seafood soup, and sancochado which is made with corn, potato, yucca, carrots, cabbage, and meat. Sánguches (sandwiches) are particularly popular in Lima where they are usually made with sliced pork, either jamon del pais (country ham), jamon norte (similar to a US-style Virginia ham), or chancho asado (grilled pork). Chaufa con mariscos (seafood fried rice) at Mistura. Chifa is a synthesis of Cantonese cooking using Peruvian ingredients. 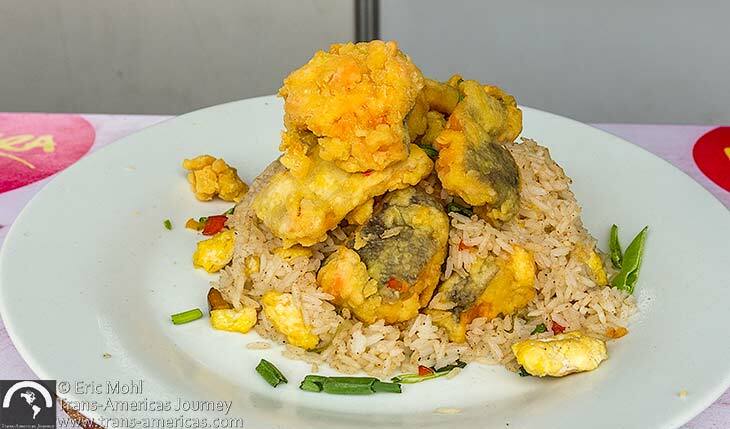 Its most emblamatic dish is chaufa, think of it as Peruvian fried rice which can be simple, or elaborate..
Foods from the Amazon region of Peru. 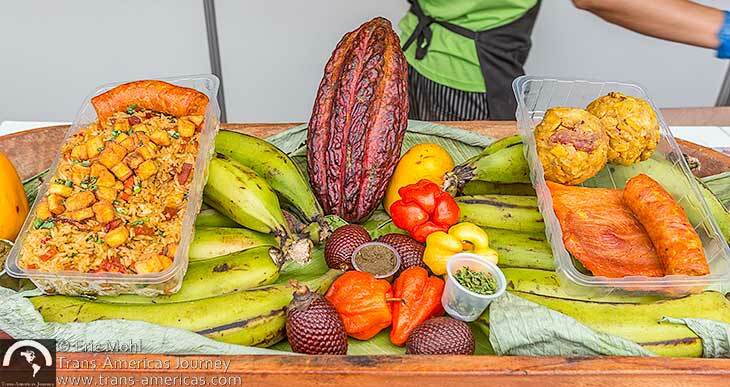 Peru is a relatively large country and 60% of it is covered by the Amazon, so it’s no surprise there is a unique cuisine de la selva (jungle cuisine) incorporating the unique ingredients found there. Juanes (shown earlier) are one example. Tacachos, balls of mashed plantain usually containing chicharron (fried meaty pork skin) or cecina which is wonderful smoked pork which tastes like bacon but with less fat. 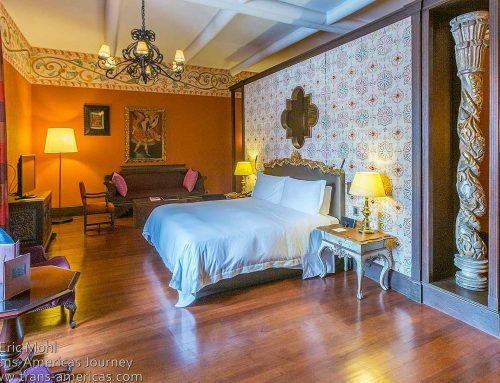 The plate on the right in the photo above has two tacachos made with cecina along with a chorizo and a piece of cecina on the side. 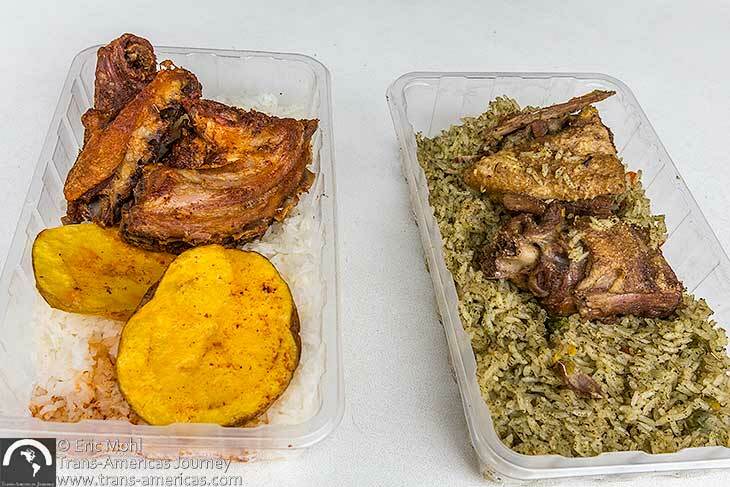 The plate on the left includes chaufa Amazonica, a version of chaufa incorporating Amazonian ingredients like cecina, chorizo, and plantains. 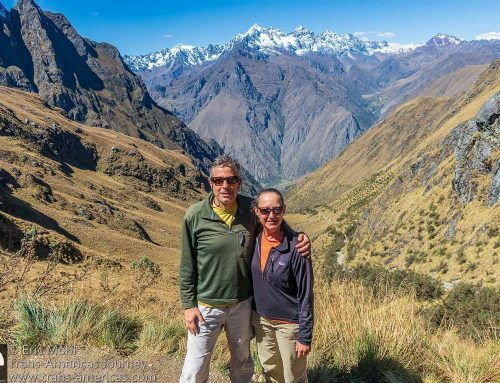 Chuchmanca (left) and Puca Picante (right). 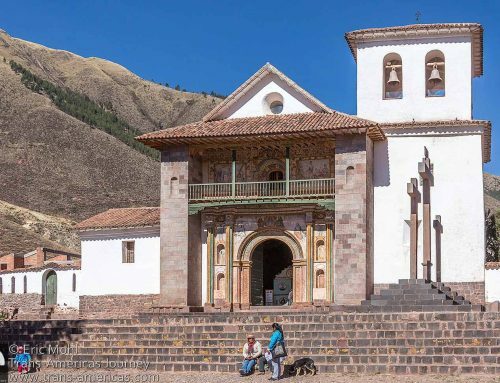 Traditional Peruvian meat dishes include puca picant, a traditional dish that comes from Ayacucho. Puca means red in Quechua and picante means spicy in Spanish, so the name literally means “spicy red. Here it’s served with chicharron (fried meaty pork skin). Cuchimanka or cuchi kanka (lemeans roast pork in Quechua. On the plate above it’s served with habas (fava beans) and a potato with cheese. Cabrito al horno (left) and aroz con pato. Another traditional Peruvian meat dish is cabrito al horno which is oven roasted baby goat. 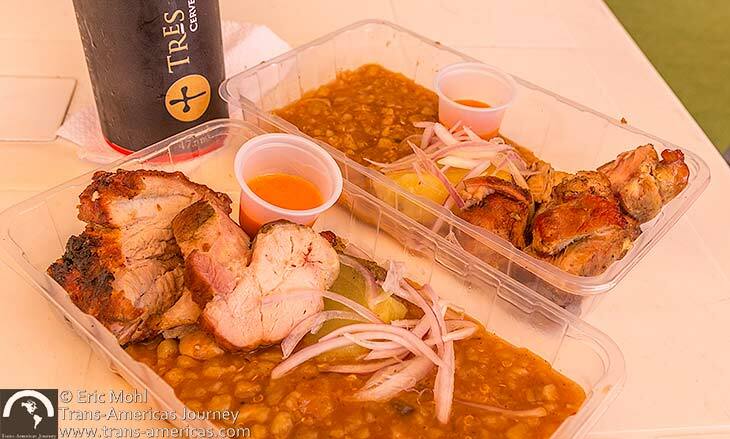 Arroz con pato (rice with duck) is another beloved dish, particularly in northern Peru. The grill area (brasas) at Mistura is enormous and popular. 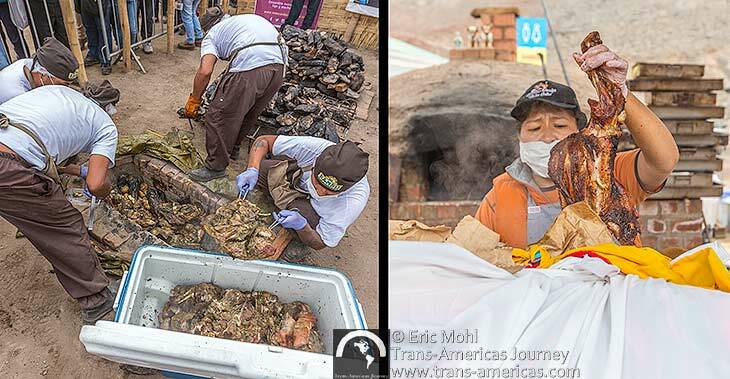 Here you can find chancho a la palo which is a whole pig splayed out and cooked over an open fire. 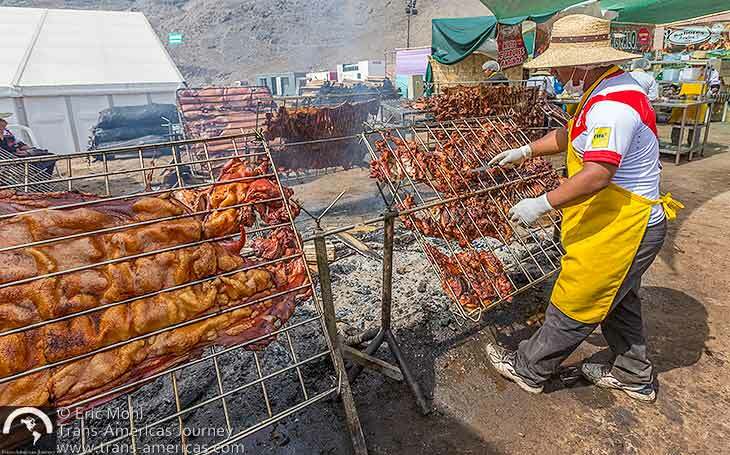 Chancho al cilindro, pork grilled in a barrel, is another favorite. Cuy (guinea pig) was one of the most popular dishes at Mistura. Cuy a la palo is guinea pig cooked on a skewer over a fire. The longest line we saw at Mistura was for cuy a la palo and cuy was the most sold item at Mistura this year. Workers using traditional Pahamanca in-ground cooking techniques (left) and Kankachos seasoned lamb cooked in a clay oven. Caja China is a method of cooking in which meat is cooked under coals placed in a box. 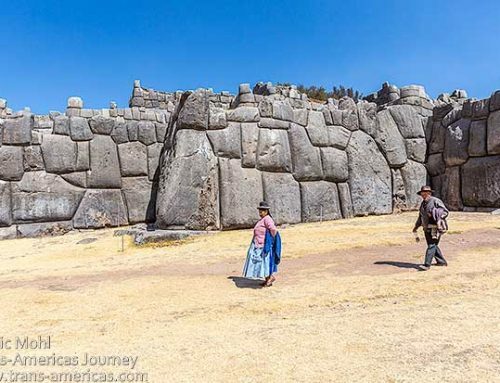 Pachamanca (from the Quechua words for earth and pot) uses an Incan form of cooking with meat and potatoes placed in the ground and covered with hot stones. Kankachos (right) is seasoned lamb wrapped in a fabric and cooked in a clay oven. Sweets to eat at Mistura. Sweets and desserts are a big deal throughout Latin America. Peru offers picarones (fried rings of dough topped with sauce – like a thin, crisp donut), yucitas (fried yucca flour like a beignet), arroz con leche (rice pudding in many forms), turrones, alfajores (similar to their more famous cousins from Argentina), and lots of types of helados (ice cream) including versions made with quinoa and one made with cheese. Sweets to drink at Mistura. You can also drink your dessert in Peru. 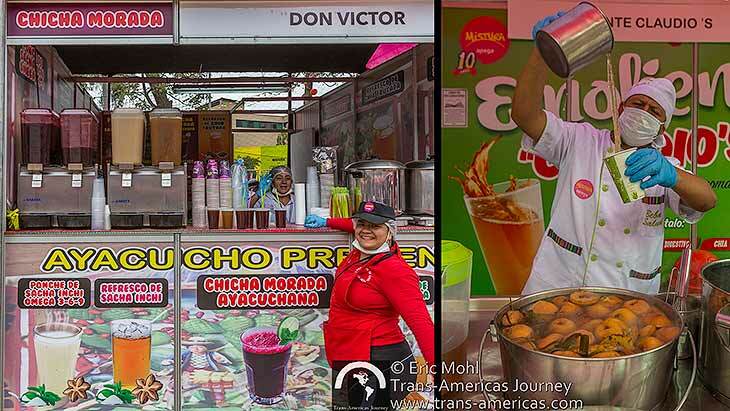 Beloved sweet beverages include chicha morada (left) and emoliente (right). At Mistura we saw Peruvian produce we’d never seen before. 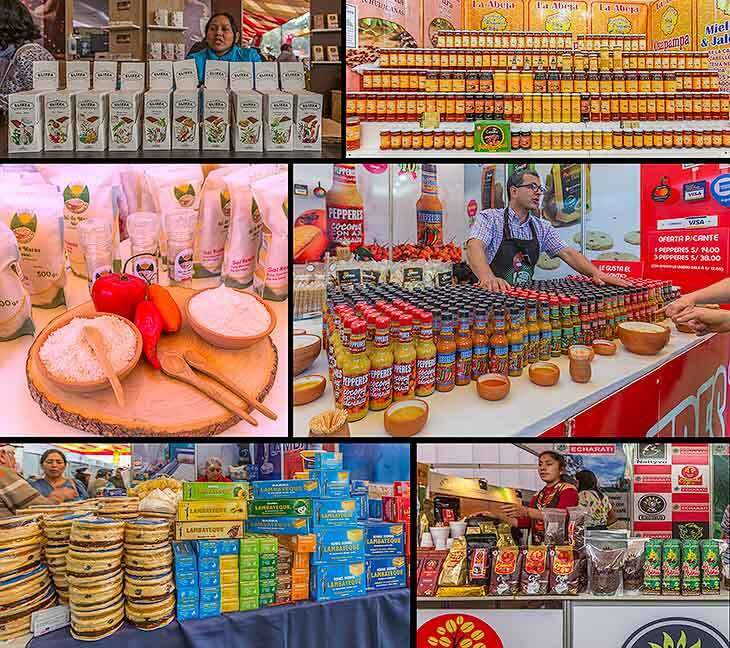 In addition to the vendors selling specific dishes, Mistura also includes a large market area where people bring produce and ingredients from around Peru. 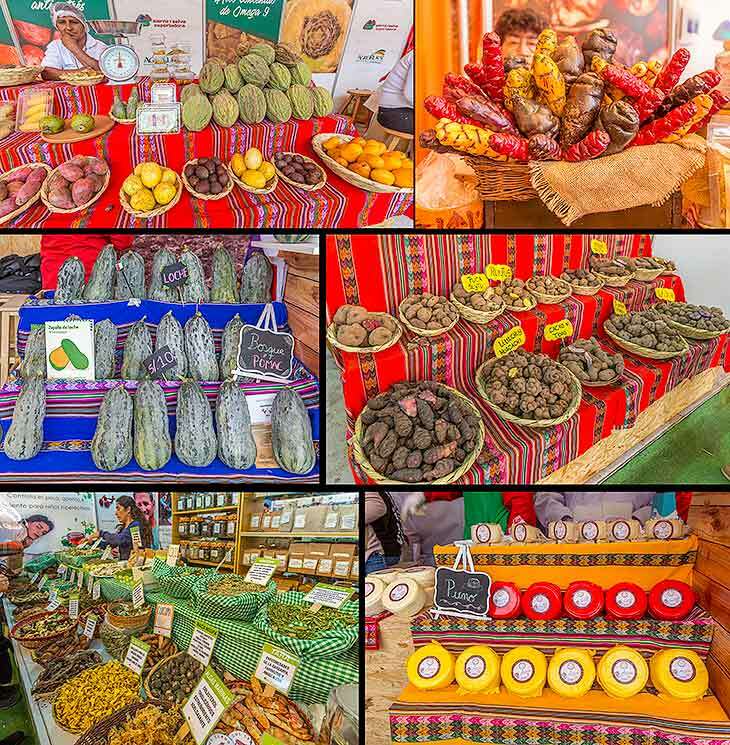 Vendors and producers from across Peru bring their best to Mistura. We bought blueberries from Canete, sausage from Cajamarca, olives from Tacna, and chocolate from Masano. There was also tempting produce, bread, coffee, potatoes (some varieties we’d never seen before) and much more. 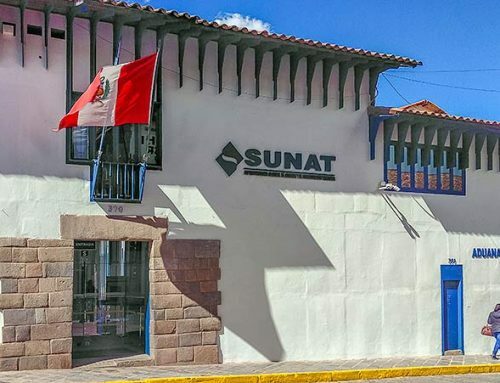 The very popular Peruvian craft beer area. 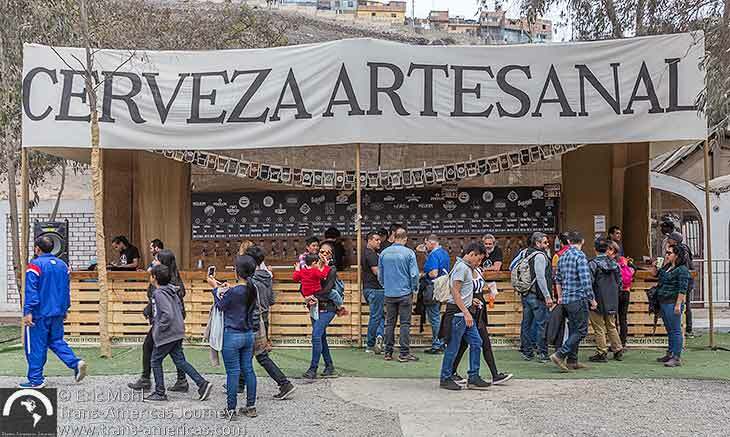 In recent years, as Peru’s craft beer scene has exploded (we know of at least 30 individual beer makers in Peru right now), a craft beer area has been added to Mistura as well. This year 19 artisanal breweries offered 30 different beers on tap to an eager crowd. A standout was the lemongrass wheat beer being made by Teach. It wouldn’t be Peru without pisco. 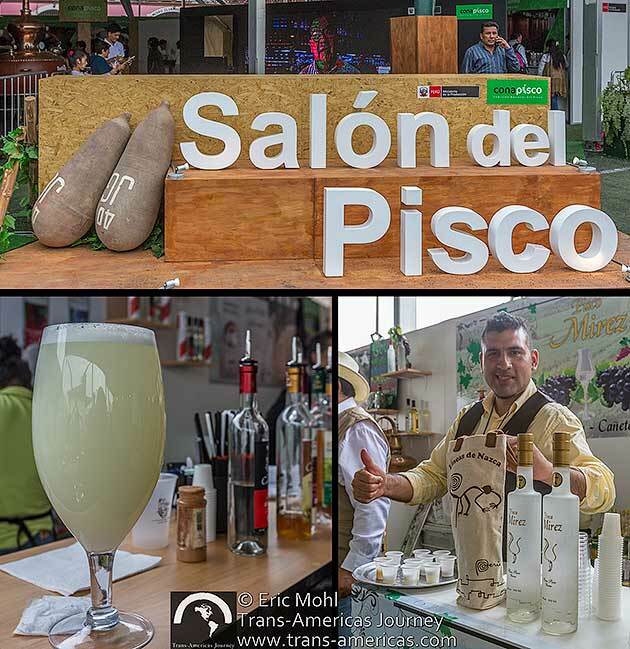 Of course Peru’s national liquor, pisco, is represented. We like pisco, but we’re not big fans of the famous pisco sour cocktail which is usually too sweet for us. We did see the biggest pisco sour ever (below) which must have been a half gallon (2 liters). Wear a hat and sunscreen. Mistura is mostly outside and on busy days shaded tables can be hard to find. Wear walking shoes. This event is spread over a large area. Wheelchairs are available for those with mobility issues. This woman was selling chancho al palo. 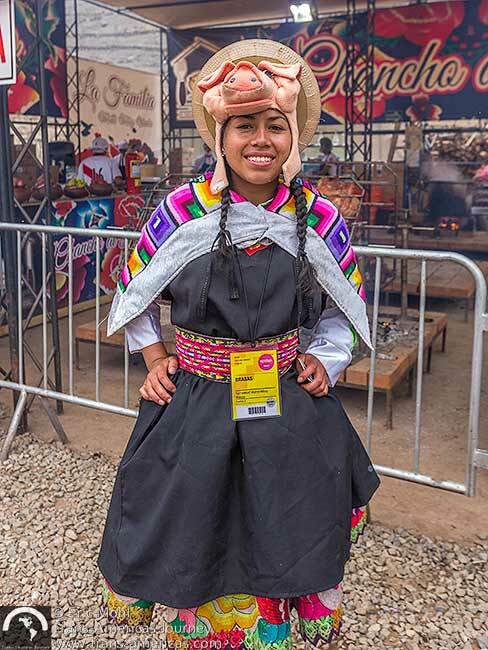 Note the pig hat under her traditional Andean hat. 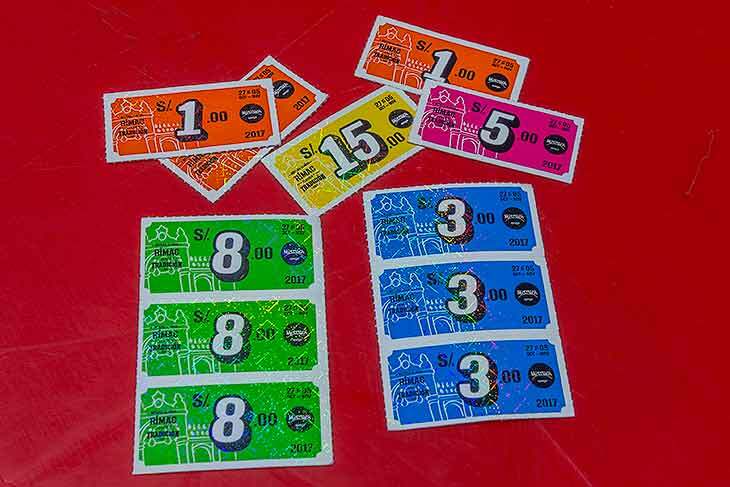 Tickets are 17 PEN (about US$5.25) on Mondays, Tuesdays, and Wednesdays and 26 PEN (about US$8) on Thursdays, Fridays, Saturdays, and Sundays. Children’s tickets are about half price. Of course, the festival is busiest on weekends. Most vendors offer two portion sizes for 8 PEN (about US$2.50) and 16 PEN (about US$5). We recommend getting the small size so that you are able to try more dishes. 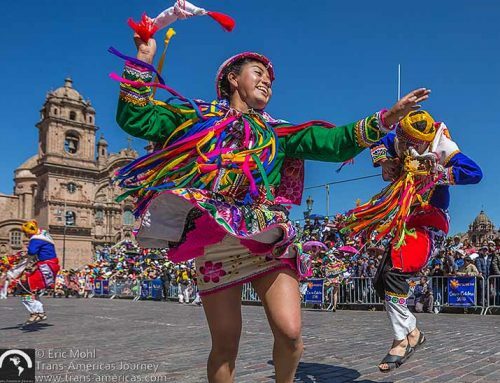 Live music and traditional dancing is part of Mistura as well. Port-a-potties were meticulously cleaned with paper and soap always available. There are no ATMs within the Mistura grounds so bring cash and credit cards. Vendors in the market area accept cash only. To buy the tickets which you use to purchase dishes you can use cash or credit cards. Wear layers. Lima weather can go from sunny and hot to foggy and cold. There are many areas where you can use cash or your credit card to get tickets for food. If one is busy, move on to another. Many of the vendors will give you a taste before you buy. 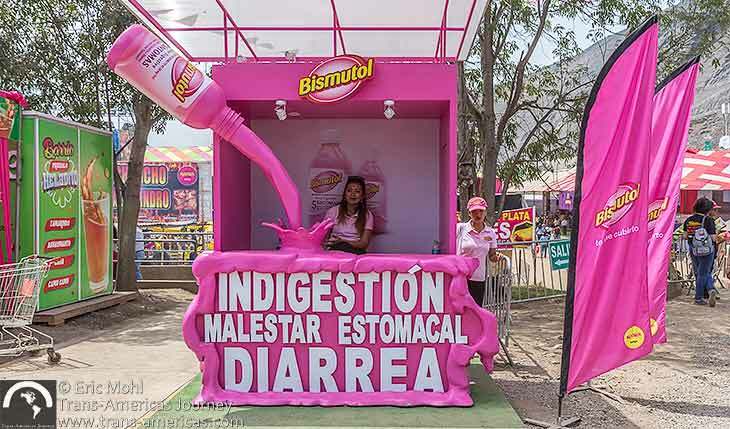 If you overdo it, head to the Pepto Bismol stand. 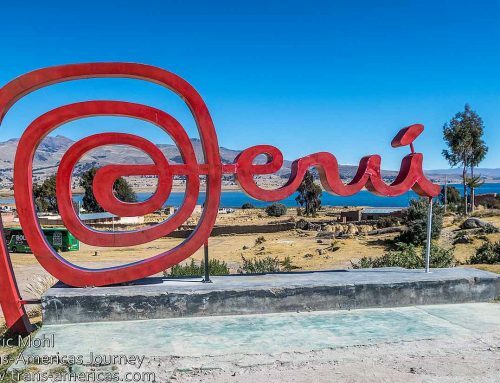 Peru’s Mistura food festival has become so big that the governing organization, Apega, is planning to expand into other countries. They’ve reportedly got Santiago, Chile, Cordova, Argentina, Bogotá, Colombia, Miami, and New York in their sights.